west end of the house. The rope broke they were trying to pull it over with and it came near falling on the house. They got it fast till Will went to town and got men with pulleys to help get it down. When he took the men back he heard Father & Mother had come home at noon. I read in the evening. We were all tired went to bed early. 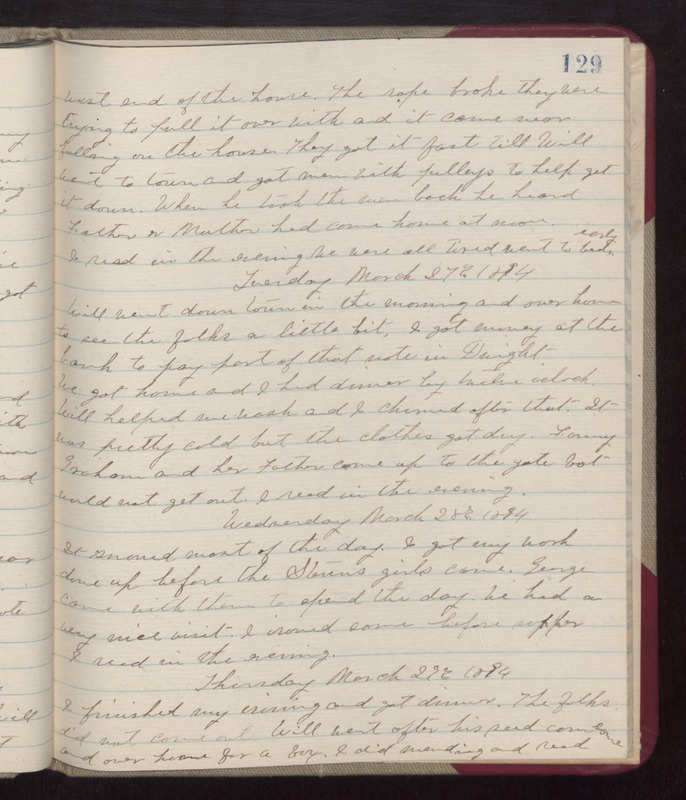 Tuesday March 27th 1894 Will went down town in the evening and over home to see the folks a little but. I got money at the bank to pay part of that note in Dwight We got home an I had dinner by twelve oclock. Will helped me wash and I churned after that. It was pretty cold but the clothes got dry. Fanny Graham and her Father came up to the gate but would not get out. I read in the evening. Wednesday March 28th 1894 It snowed most of the day. I got my work done up before the Stevens girls came. George came with them to spend the day. We had a very nice visit. I ironed some before supper. I read in the evening. Thursday March 29th 1894 I finished my ironing and got dinner. The folks did not come out. Will went after his seed corn and over home for a box. I did mending and read some.